How Differential Relay Protect Your System? Differential relays provide high-speed (1 to 2 cycles), sensitive, and inherently selective protection. These will not provide protection for turn-to-turn winding faults in generators, motors, and transformers because of the small increment in the current produced by such faults, which remain below the pickup sensitivity of the relays. An overcurrent relay can be used to provide differential protection when it is so connected that external fault currents through the current transformers balance out and do not give rise to a current in the relay operating coil. A phase or ground fault within the protected zone results in current unbalance and operates the relay. This scheme is limited by current transformer saturation at high magnitudes of external fault currents. Partial differential protection of a motor uses core balance transformers, which circle phase and neutral leads so that under an external fault situation the magnetic fluxes in the core of the transformer balance out and current transformer saturation is avoided. Percentage differential relays are used for protection of transformers, bus, motor or generator. 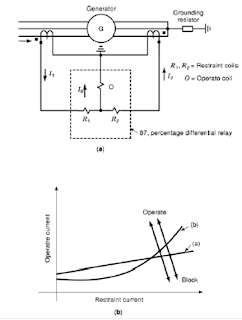 Figure 2 shows the basic connections of a percentage differential relay and its characteristics. Load and external fault current circulates through the restraint coils, and no current flows through the operating coil, except as a result of current transformer errors. For a fault in the protected zone, the difference current flows through the operating coil to actuate the relay. 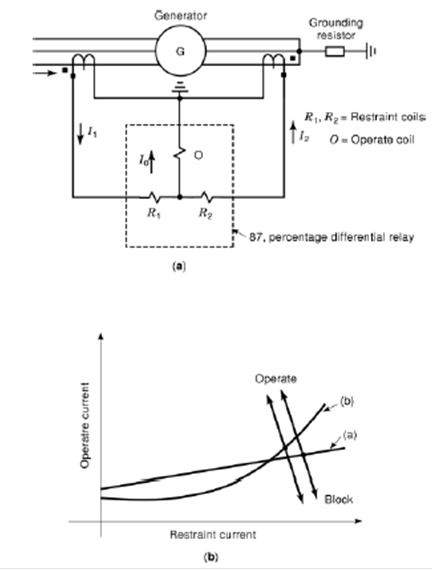 For a fixed restraint relay, the operating current required to overcome restraint is a fixed percentage of the restraint current, whereas in a variable restraint relay the current to operate the relay increases with the magnitude of fault current. The number of relay input restraint elements will vary with the design and application. For transformer differential protection, harmonic restraint may also be applied to make the relay insensitive to transformer inrush currents, which are rich in harmonics. An instantaneous trip unit is included for high-magnitude internal faults. High-impedance differential relays are primarily used for bus protection. A high-impedance relay is connected across the current transformer secondaries, which are paralleled together with proper polarity. An external fault results in currents circulating between the current transformers and creates a low voltage across the relay, which is set to operate above this value. For an internal fault, the resulting secondary voltage exceeds this set value. The current transformers must be of the same ratio. The system can easily accommodate expansion, when more circuits are added. Pilot differential relays are applied to short transmission line protection of approximately 40 km (25 mi) length or less, where a metallic, microwave, or fiber-optic communication circuit is available to compare the system conditions at two ends of the transmission line. The protection is analogous to differential protection of transformers and machines. Composite filters are used to convert three-phase currents at each end into a single-phase voltage. These single-phase voltages are compared at each line terminal over the pilot channels to determine whether the fault is inside or outside the protected zone. The pilot channels are continuously monitored for open and short circuits. Transfer trip facilities are usually added with additional relays. The series resistance and shunt capacitance of the pilot wires and the voltages developed under fault conditions are of concern. Drainage reactors, neutralizing and insulating transformers, and surge arresters are needed. These complications can be avoided and security enhanced by using fiber-optic or microwave channels and interfaces, which are not affected by fault-induced voltages.